Researchers often use mice in the early stages of their work to study how diseases develop and spread through individual and groups of mammals. Mice are again used to evaluate the effectiveness of potential pharmaceutical treatments. There are shortcomings to the use of mice as stand-ins for humans, as humans are far more complicated than mice. In Alzheimer’s research, many pharmaceuticals have shown great promise when used on mouse populations, but those successes have not been replicated in humans. One of the problems with all research involving the brain is that scientists don’t have a full understanding of how the brain works, either in mice or in men. Improvements in optical imaging techniques and computer science is allowing scientists to trace individual neurons in a brain to understand how a neuron communicates with both adjoining neurons as well as with other areas of the brain. The goal is to create an atlas, a map of the brain, showing all neural pathways within the brain and how those pathways relate to human behavior. This month the Allen Institute for Brain Science published the Mouse Brain Connectivity Atlas. The atlas was made by injecting radioactive tracers into different brain regions of mice and using a light microscope to track how the nerves connect to each other. The result is a map showing 295 neural connections among different regions of the mouse brain. The work documents the direction of the information flow for each connection, and the strength of the connections between regions as well. It provides new information about the workings of the mammalian brain and it is free and available to all, thus providing other scientists with new data to inform their own work. 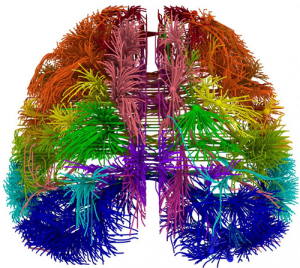 Other researchers are currently working on an atlas for the human brain. The mouse atlas will provide important insights for these researchers. When the human brain atlas is complete, researchers will gain a much better understanding of the differences between a mouse brain and a human brain. This knowledge will inform decisions about the types of studies where mice can serve as stand-ins for humans, and where mice are not sufficiently similar to humans to serve as pre-clinical test cases. Thus the mouse atlas both advances our knowledge on neural activity and will provide comparative data on human and mouse brains that will allow for better-designed clinical trials.